If there’s any location on earth that deserves to be a horror movie setting, it’s the Catacombs of Paris. Miles of tunnels wind beneath the surface of the city, filled with six million corpses, dead ends, flooded areas, dead drops, and more. While a small section is open for public tours, the vast majority of these tunnels is available only to extreme risk-takers who are willing to break the law and venture deep into the dangerous underground. Battery dies on your flashlight? You’re dead. Run out of water? Dead. Lose your way after a cave in? Lost and, eventually, dead. Seriously, tell me there’s a scarier place on earth. 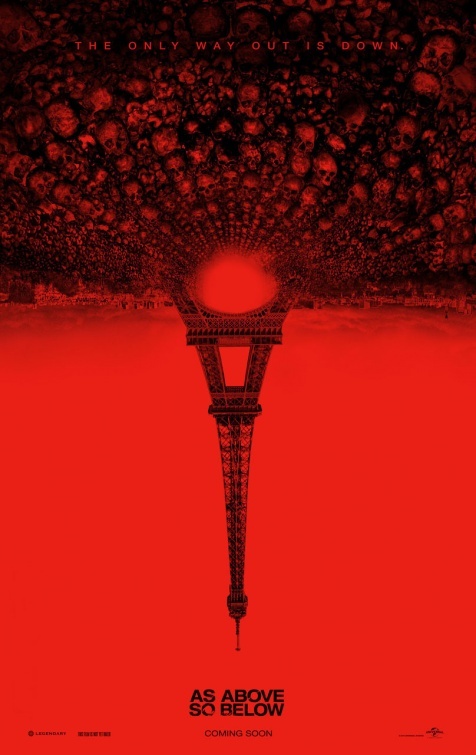 Therein lies the appeal of low-budget found-footage horror film, As Above So Below. And while it uses the catacombs to creepy effect, it doesn’t quite manage to live up to its horrific promise. The movie starts slowly after a prologue in a cave system in Iran. The main character, Scarlett, is a fearless woman who has multiple doctorates, speaks six languages, and has a black belt. Oh, and she’s also an alchemy expert seeking the legendary Philosopher’s Stone. Some clues lead her to believe that the stone may be hidden in the catacombs, so she gets a crew together and they descend. There are some truly tense moments here that will make anyone with even mild claustrophobia squirm. Early into the tunnels, they find an entrance to a “bad place,” from which no one has ever returned. Of course, they end up having to go in. Otherwise we wouldn’t have a movie. This is where the movie loses all logic and descends into pure visual madness. There is little explanation for most of the things we encounter, and a lot of shaky-cam to obscure what’s actually going on. My guess is they used that because even the filmmakers weren’t quite sure. What’s the point of having this be a search for the Philosopher’s Stone? I realize they had to have some reason to go digging around at the bottom of the catacombs, but I’m not sure this narrative thread held up too well. Especially the wishy-washy direction it eventually goes in. Why is there an inscription in Aramaic that, when translated, just so happens to rhyme perfectly in English? Seriously. That’s not how language works. Words that rhyme in one language won’t rhyme in another. Take “bug” and “rug,” for example. In Spanish, that’s “bicho” and “alfombra.” See? They don’t rhyme. I really couldn’t get past this, probably because they keep repeating bits of the stupid rhyme throughout the movie. For someone who speaks six languages, you’d think Scarlett might have questioned that. Is it creepy, though? Yes. If you have any interest in the catacombs, I’d recommend it for the cool setting alone. But if you’re looking for a brilliant horror movie, this probably isn’t it. Oh well. We can always reserve our hopes for The Pyramid, which looks basically like As Above So Below 2, but in Egypt.